Graduated from Cambridge with degrees in civil and canon law. Ordained in 1501 and served as a parish priest for four years. Carthusian monk, doing his noviate in the London Charterhouse, and making his final vows in 1516. Prior of the Beauvale Carthusian Charterhouse in Northampton, England. Prior of the London Charterhouse. In 1534 he was the first person to oppose King Henry VIII's Act of Supremacy. Imprisoned with Blessed Humphrey Middlemore. When the oath was modified to include the phrase "in so far as the law of God permits", John felt he could be loyal to Church and Crown; he and several of his monks signed the oath, though with misgivings. Father John was released, and a few days later, troops arrived at the chapter house and forced the remaining monks to sign the modified oath. On 1 February 1535, Parliment required that the original, unmodified oath be signed by all. Following three days of prayer, Father John, with Saint Robert Lawrence and Saint Augustine Webster, contacted Thomas Cromwell to seek an exemption for themselves and their monks. The group was immediately arrested and thrown in the Tower of London. True to his Carthusian vow of silence, John would not defend himself in court, but refused to co-operate or sign anything. The jury could find no malice to the king, but when threatened with prosecution themselves, they found John and his co-defendants guilty of treason. He became the first person martyred under the Tudor persections, dying with Blessed John Haile and three others. One of the Forty Martyrs of England and Wales. Third century officer in Roman army stationed in modern Austria. Military administrator of the town of Noricum, and a closet Christian. Said to have stopped a town from burning by praying and throwing a single bucket of water on the blaze, and thus his association with firefighters and those who protect us from fire, including chimney sweeps. When ordered to execute a group of Christians during the persecutions of Diocletian, he refused, and professed his own faith. Martyr. Sixth of thirteen children born to John Moÿe and Catharine Demange. Studied at the College of Pont-à-Mousson, the Jesuit College at Strasburg, and the Seminary of Saint-Simon at Metz, France. Ordained on 9 March 1754 in the diocese of Metz. Helped found schools for poor country children. Founded the Congregation of the Sisters of Divine Providence in 1762. Superior of the seminary of Saint Dié. Joined the Paris Foreign Mission Society in 1769. Missionary to China in 1773. Repeatedly harassed and imprisoned for spreading the faith. In 1782 he founded the Christian Virgins, a group of religious women who followed the rules of the Congregation of Providence, but were not a formal Congregation; they cared for the sick, and taught Christianity to women and children in their own homes. His health broken, Father Moÿe returned to France in 1784 where he resumed direction of the Sisters of Divine Providence. Preached missions in Lorraine and Alsace in France. Exiled from France in 1791 as part of the French Revolution; he and the Sisters moved to Trier. When French troops captured the city, typhoid fever broke out; he and the Sisters devoted themselves to hospital work where he died of the disease himself. Educated at the University of Warsaw, Poland. Joined the Franciscan Order of Friars Minor Observant. Doorkeeper in his monastery. Elected provincial of his Order in 1487 and again in 1496. He sent Franciscan missionaries to Lithuania; their work brought many schismatics back to the Church. A noted preacher, he travelled across Poland, evangelizing from one end to the other. In 1498 he led a prayer campaign to protect Poland from invading Tatars and Turks; a raging winter storm stopped the invaders, the Polish army routed them. and the victory was attributed to the prayer warriors. Abbot of the Warsaw monastery. On Good Friday 1505, while in prayer, Ladislas levitated, hanging in the air as if crucified; when he came down he collapsed completely, and was bed-ridden until his death a few weeks later. Born the nobility, related to the princes of Lithuania, Michal suffered from a number of birth defects including being a dwarf and having the use of only one foot. Though his formal education was frequently interrupted and limited, he was an exceptional metal worker. Joined the Augustinian Canons Regular of the Penance of the Blessed Martyrs, an Order now extinct, in Kraków, Poland where he lived as a hermit in a cell next to an Augustinian monastery, and finished his education at the University of Kraków. Known for creating sacred vessels for Mass. Received a vision of Christ who told him, “Be patient until death, and you will receive the crown of life.” Known for the gifts of prophesy and miracles. Educated at Christ's College and Corpus Christi College, University of Cambridge; made a Fellow of Corpus Christi in 1510. Entered the Bridgittine Order in 1513 at Syon Abbey, Isleworth, England. Noted for his scholarship and personal holiness. Arrested on 28 April 1535 with Carthusian priors for the treason of refusing to acknowledge King Henry VIII as head of the Church. Martyr. Educated at Cambridge. Priest. Carthusian monk and prior of Our Lady of Melwood, a Carthusian house at Epworth, on the Isle of Axholme, North Lincolnshire, England in 1531. Imprisoned, tortured and martyred on the orders of Thomas Cromwell when he refused to take the Oath of Supremacy recognizing English royalty as head of the Church. Martyr. Student under Saint Corbinian. Benedictine monk. First abbot at the Scharnitz Monastery at Garmisch-Partenkirchen, Germany in 763. Bishop of Freising, Germany in 765. 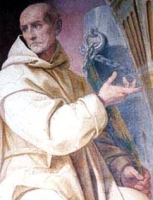 He increased the reputation of the diocese for prosperity and religious devotion, founded several convents, and make the Freising cathedral school and library famous for its scholarship. Author of the first Latin-German dictionary. Wrote a biography of Saint Corbinian, and transferred his relics from Mais to Freising in 767. Carthusian priest. Prior of the Carthusian charterhouse of Beauvale in Nottingham, England. 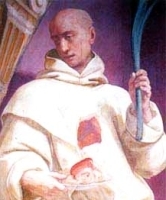 Martyred with several brother Carthusians. Born to the nobility. Monk at the monastery of Saints Marco e Lucia del Sambuco in Perugia, Italy. Spiritual student of Saint Sylvester Gozzolini. Miracle worker. Hermit at Montefano, Italy. Bishop of Ancona, Italy, possibly the first. Martyred, possibly while on a pilgrimage to Jerusalem. His name has led to much speculation about his origin, about which we know nothing for sure, and many legends, some blatantly anti-Jewish, have been attached to his story. 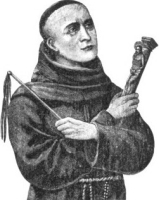 Sixth century Bendictine monk, and a disciple of Saint Benedictine himself. Sent to France by Saint Benedict to establish the Order there. Founded the Monastery of Saint-Julien in Tours, France, and served as its first abbot. 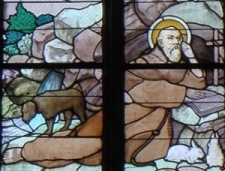 Feeling a need for greater solitude, Antonius retired to spend his later years as a prayerful hermit at Le Rocher on the banks of the River Loire; the place is now known as Saint-Antoine-du-Rocher. Born a prince, the son of King Penda of Mercia in England. Ethelred became king of Mercia himself in 674. Abdicated in 704 to become a monk at Bardney Abbey where he later became abbot. Brother of Saint Thumette, the two of them sailed on a stone from Wales to Bigouden in Brittany in northern France. 6th century hermit. No details of his life have survived, but many local oddities in the area have been linked to him with miraculous stories. Premonstratensian nun in the monastery of Engelport, Germany, entering the Order in 1450, and living her faith for the next 82 years, even working with the poor during a famine in 1530 - at the age of 100. Bishop of Ancona, Italy. Martyred in the persecutions of Julian the Apostate while on a pilgrimage to the Holy Lands. Tortured and martyred in the persecutions of Diocletian and governor Priscillian. 15th century Augustinian nun at the convent of Blessed Michela in Vercelli, Italy. Bishop of Gaza. Branded and sentenced to forced labour with 39 of his clergy by command of Caesar Galerius Maximian during the persecutions of Diocletian. Martyred with 39 fellow Christians. Imprisoned for two years, repeatedly tortured and eventually executed for her faith during the persecutions of governor Priscillian. Christian maiden who was tortured and martyred in the persecutions of Diocletian and Galerius. Priest who evangelized in the area of Umbria, Italy, working from Camerelle Rino. Martyred in the persecutions of Decius. Third century deacon in Rome, Italy. Missionary to Auxerre, Gaul (modern France), sent by Pope Sixtus II to assist the area's first bishop, Saint Peregrinus of Auxerre. Daughter of the Duke of Lorraine. Married lay woman. Widow. Founded a convent at Thorn (now in the Netherlands), and joined it as a Benedictine nun. Abbess at Thorn. Born to the 14th-century Castilian nobility. Member of the Mercedarians. Redeemed and freed 118 Christians from slavery in Muslim Morocco in 1403, and while there preached to the Moors. Nephew of Saint Helidorus. Soldier. Officer in the imperial body guard, a post he resigned to become a priest. Nun at Niedermunster convent in Ratisbon, Germany. Bishop of Albee. Martyred with a group of his disciples. A group of clergy and laity martyred together in Cirta, Numidia (in modern Tunisia) in the persecutions of Valerian. They were - Agapius, Antonia, Emilian, Secundinus and Tertula, along with a woman and her twin children whose names have not come down to us. A bishop and several his flock who were martyred together in the persecutions of Diocletian, and whose relics were kept and enshrined together. We know nothing else about them but the names - Apollo, Bono, Cassiano, Castoro, Damiano, Dionisio, Leonida, Lucilla, Poliano, Tecla, Teodora and Vespasiano. 85 English, Scottish and Welsh Catholics who were martyred during the persecutions by Protestants in the 16th and 17th centuries. They are commemorated together on 22 November.